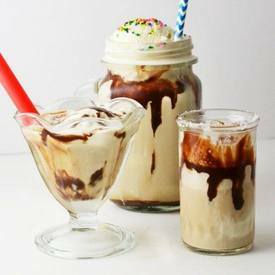 Salted coffee & kahlua milkshakes! We’ve been dreaming up berry delicious milkshake dreams this week, toasted marshmallow pillows included! There is something about a bold coffee brew and Kahlua that can make any day seem right. Pour that combo over creamy ice cream and you’ve got us floating on cloud nine! We’ve taken the classic after dinner coffee beverage and made it into a must-have dessert with this simple recipe!